There’s not much to tell about Gonzo’s Quest, except that it’s crazy-popular, it’s a signature slot by Netent, it has fantastic graphics, the great Avalanche feature, Free Falls mode, and an iconic mascot character. Alright, turns out there is much to tell. And we’re about to tell it. Gonzo’s Quest is a phenomenon. Chances are, if you’ve ever visited any Netent casino, you saw an image of Gonzo the Conquistador on the promotional banners somewhere around the website. He’s a long-standing NetEnt mascot and it’s not going to change any time soon. First of all, the game looks and feels fantastic. It starts off with a short animated intro, that sets the premise for the story - little funny conquistador jumps off the ship to seek his own fortune. In the game you’ll see pretty modern graphics, smooth animations, Gonzo showing off by the reels whenever a big win strikes, and so on. There are little details too, like the golden pyramid briefly visible in the background when the symbols fall. Yeah, “fall”, not “spin”. The difference is mostly visual, because there are still reels and paylines, and such, but it looks cool anyway. The game introduces Avalanche feature, that will help you win several times in a single spin, and it also has free spins (Free Falls) and a wild symbol. The Avalanche works like this: if there’s a winning combination after a spin, the symbols that form it blow up (after paying out the win of course). The above symbols drop into their places, and the games checks for wins once more. If there are any - the process repeats. It gets better - each time this happens, you’ll see the multiplier meter above the reels increase (up to the maximum if x5). As soon as there are no new wins, the multiplier resets. The wild symbol (question mark) is standard, and only substituted for other symbols in a combo. The free spins are triggered by three bonus symbols (golden tablet). The bonus symbols is not a scatter, meaning that it has to appear on a payline, from left to right, just like any other symbol, to activate the free spins. The round of 10 Free Falls would have been pretty generic, if not for one thing: the Avalanche multiplier is tripled, i.e. is starts at 3 and increases up to x15. Get that high, and even the tiniest combination will bring some nice prizes. 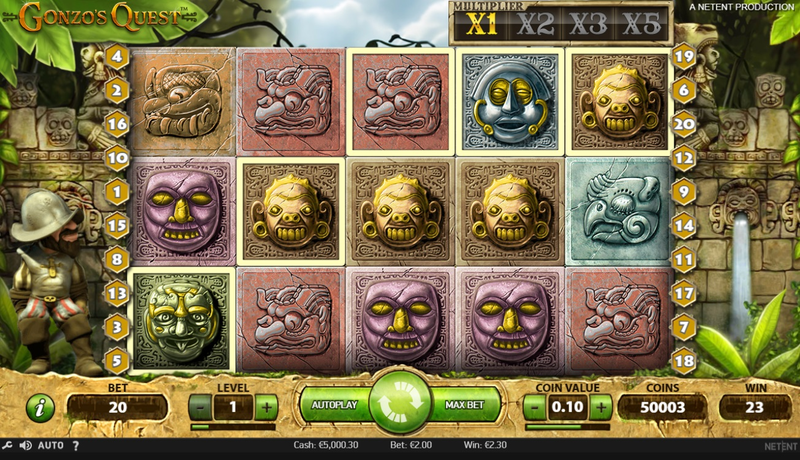 Gonzo’s Quest is the modern classic of slot games. For a couple of good reasons too - pretty graphics, pretty high RTP (96%), and a great Avalanche feature that is further boosted in the free spins. If you haven’t played Gonzo’s Quest yet, you’ve probably lived in a cave somewhere. Go play it finally.